Preheat oven to 350ºF. Season chops with salt and pepper, as desired. Heat a large nonstick ovenproof skillet over medium-high heat. Spray with olive oil. Add Open Prairie Natural Pork chops and cook, turning once, until browned on both sides, about 6 minutes. Transfer skillet to oven and bake until chops barely spring back when pressed on top with a finger, about 6 minutes. Transfer each chop to a plate. Add orange zest and juice with balsamic vinegar and chopped sage to skillet and bring to a boil over high heat, scraping up brown bits in pan with a wooden spoon. Cook until reduced by half, to 3 minutes. Season with salt and pepper, as desired. Spoon sauce around chops. 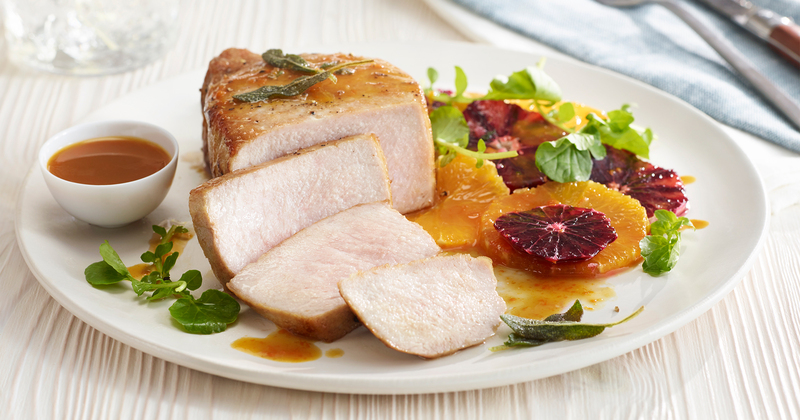 Garnish with orange rounds and sage sprigs and serve. Crisp Sage Garnish: Substitute about 12 fresh sage leaves for the sage sprigs. Heat 2 tablespoons vegetable oil in a small skillet over medium-high heat until oil shimmers. Add sage and cook just until crisp and barely browned, about 15 seconds. Using a slotted spoon, transfer sage to paper towels to drain briefly. Sprinkle over chops just before serving.